Advanced API Security is a complete reference to the next wave of challenges in enterprise security--securing public and private APIs. API adoption in both consumer and enterprises has gone beyond predictions. It has become the ‘coolest’ way of exposing business functionalities to the outside world. Both your public and private APIs, need to be protected, monitored and managed. Security is not an afterthought, but API security has evolved a lot in last five years. The growth of standards, out there, has been exponential. That's where AdvancedAPI Security comes in--to wade through the weeds and help you keep the bad guys away while realizing the internal and external benefits of developing APIs for your services. Our expert author guides you through the maze of options and shares industry leading best practices in designing APIs for rock-solid security. 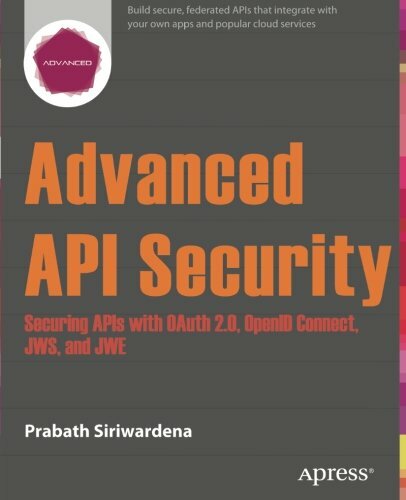 The book will explain, in depth, securing APIs from quite traditional HTTP Basic Authentication to OAuth 2.0 and the standards built around it. Build APIs with rock-solid security today with Advanced API Security. Takes you through the best practices in designing APIs for rock-solid security. Provides an in depth tutorial of most widely adopted security standards for API security. Teaches you how to compare and contrast different security standards/protocols to find out what suits your business needs the best. If you have any questions about this product by Siriwardena Prabath, contact us by completing and submitting the form below. If you are looking for a specif part number, please include it with your message.